Length 32-7/8 inches. Beam approximately 3.50 to 3.54 inches at the water line after 1/32" balsa is applied to the hull. The Gearing Class was a series of 98 destroyers built for the U.S. Navy during and shortly after World War II. This Combat Vac-U-Gearing Hull Kit Features: Tough High-Impact Polystyrene Hull with polyurethane-bonded sub-deck and carbon-fiber reinforced hull ribs & sub-deck cross-members. 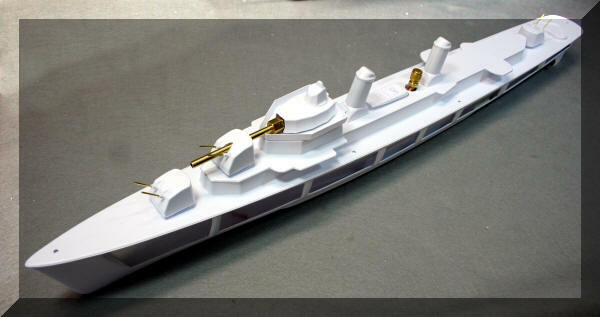 The sub-deck hatch openings and the hull's pre-formed penetrable area panels can be removed with a hobby knife or box cutter. Clear hatch lids & hatch tape waterproof the hull. The deck is secured with stainless steel screws, supports realistic details and can house a Bow or Stern 50-round cannon (Not included). All is supported by the included display stand. 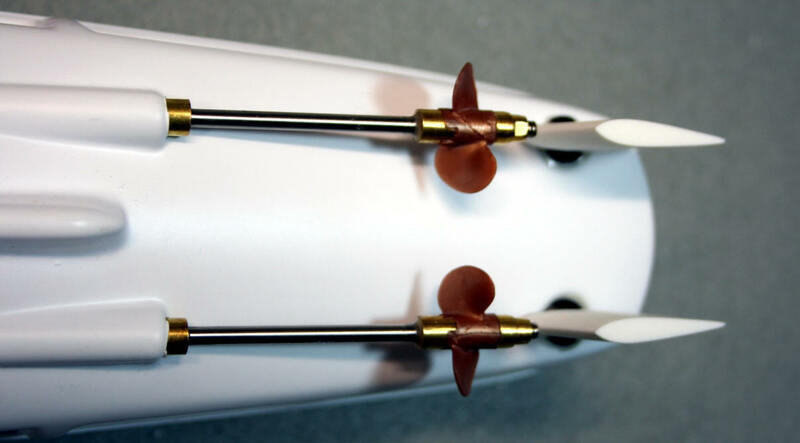 The Rudder Package includes twin rudders totaling 2.25 square-inches are cast on brass shafts with a self-aligning rudder brackets, rudder arms, stainless pushrods, and E-Z Connectors for the included servo, a Turnigy 9025MG metal-gear non-waterproof servo that can be made water-resistant. 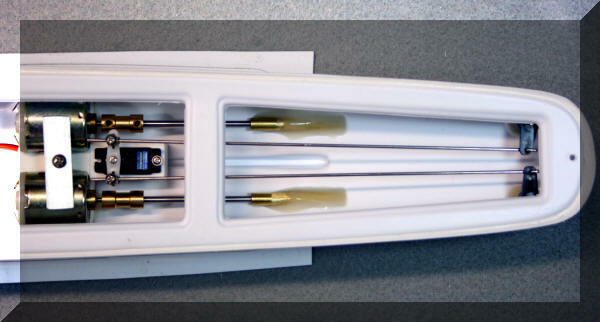 The Twin Drive Package includes two 365 motors direct-driving counter-rotating precision stainless steel shafts supported by Oilite® bushings in brass stern tubes with brass couplings, copper colored polyurethane 2-blade injection molded props, 6-32 threaded drive-dogs and prop nuts. 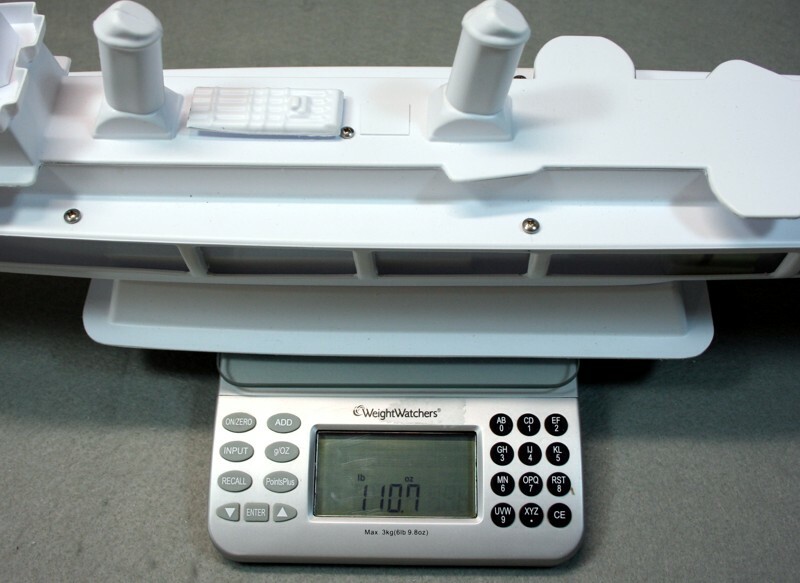 THE COMPLETED KIT WEIGHS 1 POUND 10.7 OUNCES (760g). 4 Meg File. May load slow. Click to open a PDF. 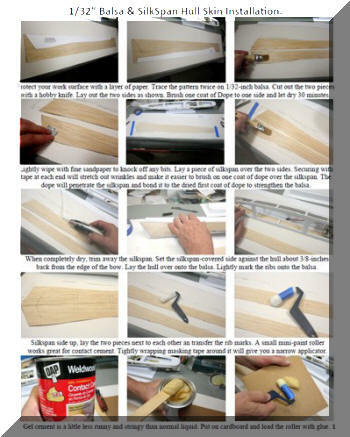 Applying balsa-silkspan hull skin instructions. Click framed photos to enlarge. Twin drive includes metal gear servo. 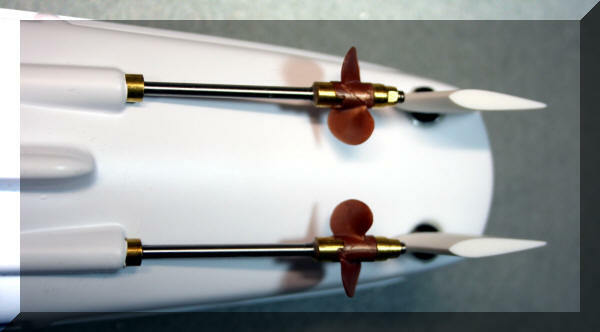 Pre-aligned mounting points for rudders and prop shaft stern tubes. Optional Avenger Bow Cannon installed. 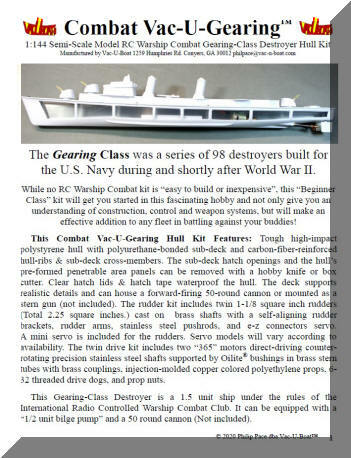 While no RC Warship Combat Kit is "easy to build or inexpensive to outfit", this "Beginner-Class" kit will get you started in this fascinating hobby and not only give you an understanding of construction, control, and weapon systems, but will make an effective addition to any fleet in battling against your buddies! Kit includes a cutting pattern for the balsa/silk-span sheeting that will help you cover both sides of the hull with one 4-inch X 36-inch sheet of balsa! Examples of finished builds and parts-sources to follow to include BB Cannons, Bilge Pumps, CO2 Regulators, Fire Control, Balsa-Silkspan Hull Covering, Radio Equipment, ESC Electronic Speed Controls, Remote Switches and Painting. Special Thanks to John, Lou, Bob & Heiko for their collaboration with this project!